Whee! IMATS, the International Makeup Artists Trade Show, is coming to London on the 10th – 12th July 2015, and we’re over the moon to be going along. As a business, it will be our first time exhibiting at the event, although of course we’ve all swung by as shoppers at least once or twice. 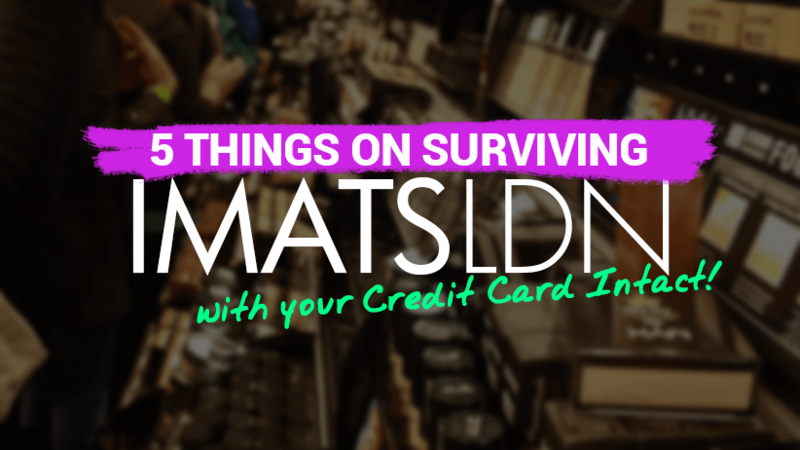 If it’s going to be your first time at the event too, you’ll find these IMATS survival tips will come in very handy. Before you even think about what you’re going to be doing, set yourself a budget and stick to it! There are loads of exclusive show discounts on offer, so it’s worth saving up so you can bag a few bargains. You might even want to take cash and leave those credit cards at home; it’s faster and it means you won’t walk into Kryolan or MAC walk out with half your rent gone. With so much going on at IMATS, it’s crucial that you make a plan of attack well before you get to the show. You might be desperate to attend the Bobbi Brown bridal class on Saturday morning, or to catch David Horne on the Open Forum Stage, but if you don’t know what’s going on and when, you’re likely to miss things. Don’t forget to put your name down early for the space limited workshops to avoid disappointment. Take a look at the exhibitors list and do some research on the brands you love before you get there. There certainly are some amazing bargains to be had, but equally there will be a good deal of products on sale at full price too. If you’re after some eyeshadow from Sugarpill, it’s worth knowing what the regular prices are so you can see if you’re actually getting a show bargain or not. If you’re on Twitter, get following the style and make-up gurus that you’d love to meet at the show, otherwise you might just walk past them without noticing! Bloggers, gurus and popular vloggers will often look quite different at IMATS London to how they normally do; they could be wearing a wig, extensions, full costume, who knows! Follow them on Twitter, and they might just announce where they are at the show, giving you a chance to fangirl/boy all over their presence! IMATS is an amazing place to get up close and personal with your favourite brands, but it’s also a great place to discover something new and exciting. Rather than rushing to join the queue at Inglot as soon as you get there, spend some time exploring the stands of the brands you’ve never heard of too. You might just discover a hidden gem or two! Most importantly, get ready to have lots and lots of fun! Although originally intended as an industry show for make-up pro’s to restock at discounted prices, IMATS has become something much more social over the years. Expect to meet new friends, try new things and generally have a great time. Nanshy can’t wait for the big weekend! Come and see us on stand 310, and don’t forget your £5 off voucher, available here on the website.